Tag line: "Rising to the occasion"
Tim Burton is one of the few filmmakers working today who can craft a family movie out of death and decay, and that’s exactly what he did with 2005’s The Corpse Bride, an animated musical comedy in which the dead are more alive than the living. Though he has never laid eyes on her, Victor Van Dort (voiced by Johnny Depp) will marry Victoria Everglot (Emily Watson) in several days’ time. It was a match arranged by their parents, William and Nell Van Dort (Paul Whitehouse and Tracey Ullman), a fish merchant and his wife looking to break into high society; and Lord and Lady Everglot (Albert Finney and Joanna Lumley), a pair of upper-class elitists who, in spite of their title and spacious mansion, are flat broke. Both Victor and Victoria are apprehensive about the upcoming nuptials, but their fears subside when they meet each other and instantly fall in love. Still, during the wedding rehearsal, a nervous Victor has a hard time remembering his vows, and is sent away by Pastor Gallswells (Christopher Lee), who tells the young man not to return until he’s memorized them perfectly. While walking through the woods, practicing his vows, Victor places a wedding ring on what appears to be a root that’s pushed its way out of the ground. In reality, it was the finger of the Corpse Bride (Helena Bonham Carter), who is under the mistaken impression that Victor has just married her. Whisked away to the Land of the Dead, Victor tries to convince the Corpse Bride (who died while waiting for the love of her life to elope with her) that it was a misunderstanding, and does everything he can to get back to Victoria. Upon hearing the news that Victor was seen walking with a mysterious brunette, the Everglots break off the engagement,and turn their attention to Lord Barkis (Richard E. Grant), a “distant relative” who showed up early for the ceremony. Believing he, too, can end their financial woes, they announce that the wedding will go on, with Lord Barkis as Victoria’s new groom. But is Lord Barkis truly who he claims to be, and if not, can Victor save Victoria from a fate that could very well be worse than death? 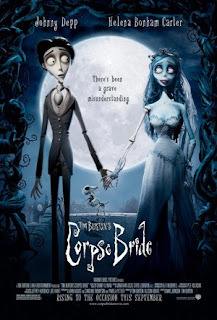 The voice talent does a superb job bringing these characters to life; Depp and Watson are especially good as the young lovers, and Bonham-Carter evokes our sympathy as the poor Corpse Bride, whose untimely end has ensured that she will spend eternity searching for true love. Yet what I liked most about The Corpse Bride was the way it depicted the various worlds inhabited by its characters, namely the Land of the Living, which is gray and depressing; and what exists “below” ground, a wild, raucous place filled with color, where everyone is happy. Even the musical numbers, written by Danny Elfman, reflect these differences. “According to Plan” sung by the parents of Victor and Victoria, is a dark, gloomy tune that lays out the reasons why the marriage is so important to each family (mild spoiler: not a single one has anything to do with the intended bride and groom or their happiness), while “Remains of the Day”, performed soon after Victor arrives in the Land of the Dead, is an upbeat, jazzy song featuring a skeleton band. Victor experiences the “joy” of being dead for himself when the Corpse Bride, as a wedding gift, gives him the skeletal remains of his dog Scraps, who died when Victor was a child, but is as alive and peppy as ever in the Netherworld. While the movie does contain a few scenes that could potentially frighten younger viewers (when first awakened, the Corpse Bride rises from the ground and chases Victor through the forest), The Corpse Bride is a gorgeously animated (via stop-motion, in the same vein as The Nightmare Before Christmas) musical romance, and a film that, despite the fact half the characters are deceased, is brimming with life. What a wonderfully twisted movie. As always, the real gem of the cast in a Tim Burton flick is Helena Bonham Carter. She's magnificent, as always.